This is a very professional-looking piece of equipment from Velleman. 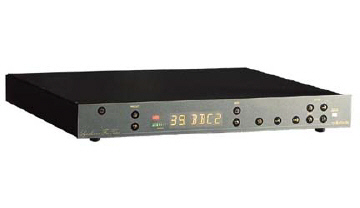 Technical specifications are listed at Velleman's own page for this tuner. It has 40 presets, with alphanumeric labels of up to four characters to describe each station, and two selectable aerial inputs. There is also a remote control which can be used with both the tuner and Velleman's preamplifier, but I didn't buy one for cost reasons. I added one or two modifications to the tuner after I finished it, some for convenience, and some to improve the sound quality. I replaced some of the power supply electrolytics (pretty standard quality items) with Gemcon high-frequency SMPS caps to reduce the impedance of the power supplies at higher frequencies, and bypassed the PSU smoothing caps with 2.2uF polypropylene caps. I replaced the 15VA frame mains transformer with a 30VA toroidal transformer to reduce external EM fields. I added a balanced output stage, with a couple of OPA2604 dual op-amps, and separately regulated power supplies for each channel. This bypasses the existing output stage (single-ended output is still available, connected to the "hot" output), and also bypasses the muting circuitry on the output of the latter (a couple of NPN transistors and some 330 ohm resistors), which will reduce distortion. I added a couple of XLR sockets on the back for the balanced outputs - that steel case is certainly hard work to drill! There were a couple of 10uF electrolytics coupling the stereo decoder to the output stage, each of which I replaced with a pair of paralelled 4.7uF polypropylenes (these were a tight fit under the lid). I disconnected the signal earth from the case, to prevent earth loops, and installed a stout earthing wire from mains earth to the case. This did mean, however, that the switches on the front panel don't work when the signal grounds aren't connected to the tuner case via the interconnects. I don't really understand this, but I would guess thst the switching circuitry relies on a certain amount of capacitance between the switching panel and the steel front of the case. This definitely had me puzzled for a while when I was building the thing. I'm using the tuner with a three-element Yagi, mounted in the loft, and connected with pretty ordinary reused coaxial cable. In due course I would like to move the aerial onto the roof and use better quality cabling. So far I've only tried the unbalanced output (the tuner is currently the only item in my system with balanced connections, but that will change soon). In its unmodified state the tuner sounded quite good, with fair clarity and no harshness. I didn't check the upgrades methodically as I added them, so I couldn't really say which was the most effective. I certainly noticed an improvement when I replaced the electrolytic coupling capacitors with polypropylenes, which gave a substantial improvement in clarity and pushed the rear of the soundstage back noticeably. I hoped to hear a difference when I upgraded from TL072s to the Burr-Brown op-amps, but I couldn't convince myself that there was one, at least through my system as it was at the time. It would be interesting to compare my tuner with a stock K4500, of course. There is still a little softness and lack of definition in the bass, which may be related either to the power supplies or (less likely) to the chip set. I may experiment further, but I'm getting plenty of listening pleasure from the radio as it stands. I have just sorted out a serious problem which arose with the tuner after about a year and a half of being nearly continuously powered up. One of the components in the power supply (R105, a 22 ohm 1W resistor), failed, and I also saw signs of overheating around the Zener diode feeding the -12V line (ZD3). I suspect that these components may have been operating too close to their power limits, though the problem may have been worsened by my replacement of the electrolytic coupling caps before the output stage by the much larger polypropylene caps, which could have obstructed heat flow in the already restricted space above the main PCB. I carried out a comprehensive rebuild of the power supply, adding a separate 18-0-18V 120VA toroidal transformer and LM317/337 pre-regulator for the output stage (almost certainly overkill!). More significantly, I bolted a pair of 7812/7912 regulators to the chassis near the tuner PCB, the 7912 replacing the Zener regulation circuit, and the chassis mounting substantially improving the dissipation for the regulators. The positive regulator now supplies the +12V line for the whole board (except for the output stage), as well as providing pre-regulation for the +5V supply for the logic circuits and LED displays. This should clean up the power supplied to the PLL and decoder chips, as well as reducing power-line interference to the logic chips. I have a fairly poor mains supply and have suffered the odd loss of channel settings in the past, so I hope these changes will lessen the chances of this happening again. I have also had problems with the connector attached to the front panel display - this was a pain to instal in the first place, with the tenuous copper film on the plastic sheet being very vulnerable to abrasion, and the connector itself is pretty flimsy. In the end I resorted to repairing this with Electrolube Silver Conductive Paint (£7.50 for 3g from Maplin), which did the job fine. FM tuner info page with tweaks to Kenwood tuners.